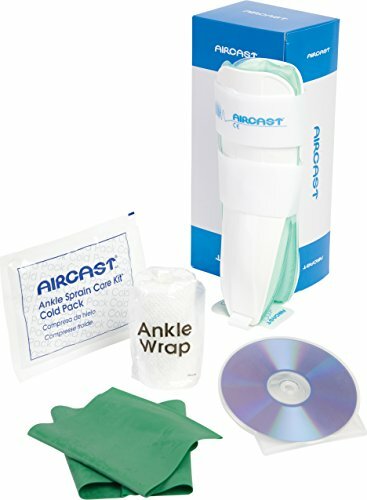 The Aircast Air-Stirrup Ankle Sprain Care Kit is a complete comprehensive system that provides treatment, rehabilitation exercises and educational materials to help you properly care for your injury. This kit includes an Aircast Air-Stirrup Ankle Support Brace, cold pack, exercise band and an instructional booklet with DVD. The Aircast Air-Stirrup Ankle Support Brace is commonly worn immediately after an ankle injury and throughout recovery. It's intended to prevent or treat acute ankle injuries, chronic instability, post-operative use and ankle sprains grade I, II, and III. Featuring semi-rigid, anatomically designed shells which help stabilize and protect the ankle. These shells are lined with patented Duplex air cells that enhance circulation and reduce swelling and edema. The air cells are pre-inflated, and provide pulsating compression while walking. This ankle support brace has a low-profile structure, allowing for minimal bulk while wearing shoes. The Aircast Air-Stirrup Ankle Support Brace resists inversion more than taping, yet normal flexion is virtually unrestricted.